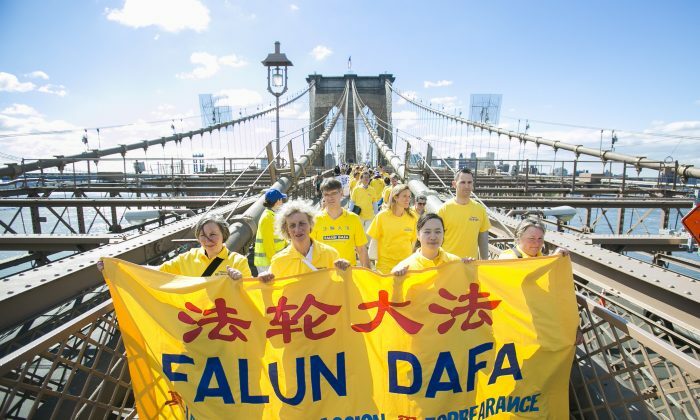 NEW YORK—They flew in from over the Atlantic to Brooklyn, and silently marched across one of America’s oldest suspension bridges bearing a simple, poignant message: People in China should be free to meditate. On a clear, breezy Wednesday morning, nearly 600 practitioners of the Chinese spiritual practice Falun Gong set off from Cadman Plaza Park and crossed the Brooklyn Bridge to Foley Square. Mostly from Europe, they hailed from 47 nationalities. The march is part of World Falun Dafa Day celebrations this week, where an estimated 8,000 Falun Gong practitioners from all over the world are taking to the boroughs of Brooklyn, Queens, and Manhattan to remind New Yorkers that millions of peaceful meditators in China aren’t free to keep their faith. Falun Gong, or Falun Dafa, involves slow moving exercises and the observance of moral teachings based on the principles of truthfulness, compassion, and tolerance. Although the practice provided health benefits for millions of Chinese after its introduction to the public in 1992, the Chinese Communist Party launched a sweeping suppression in 1999—millions were persecuted, vilifying messages were spread in international media, and tens of thousands are suspected of having been executed in a state-run organ harvesting program. “We hope that people in New York will note the severity of the persecution in China,” said Jana Skovajsova, a 31-year-old translator and interpreter from Czech Republic. “We want to let Americans know about the heinous crimes being committed by the Chinese Communist Party,” said Betty Hunter, a Brooklyn resident who organized Wednesday’s march. Hunter, a retired law firm librarian, feels that a solemn, silent march is a good way of getting the attention of people who have never heard of the persecution and engaging them in conversation. Hunter’s plan worked: On Brooklyn Bridge, Falun Gong practitioners handed out pamphlets about the practice and traumatic events from the past 16 years to passersby, and quietly explained to enquirers why they were marching. A policeman overseeing the proceedings was heard telling an elderly participant that it was “beautiful to see people from Germany, Finland, and other countries come together” to march. 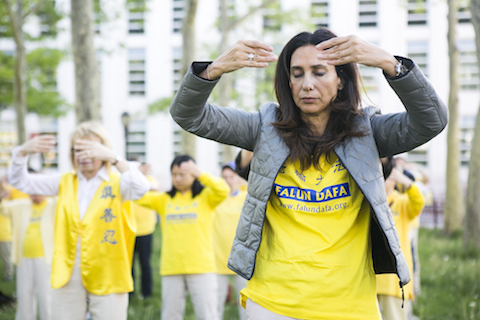 Falun Gong practitioners also hope New Yorkers can appreciate the “beauty of truthfulness, compassion, forbearance,” said May Bakhtiar, a designer from Switzerland. Bakhtiar, a youthful looking 52-year-old, was introduced to Falun Gong by a friend in 1997. After doing the exercises for three months, her allergies disappeared and her health improved, she said. Being mindful of Falun Gong’s moral teachings, she said, even tamed her fiery temper. “Falun Dafa is good for the mind and body, and truthfulness, compassion, and forbearance is the answer to ending the violence in the world,” Bakhtiar said. Many passersby accepted the pamphlets, and a handful stopped to listen to the Falun Gong practitioners. This wasn’t the case the last time Falun Gong practitioners marched across Brooklyn Bridge in 2000, one year after the persecution began. The Communist Party’s propaganda against the practice was still in full swing, and the violent nature of the persecution and the peaceful nature of Falun Gong had not become clear to the world. Qiu Ying, a 48-year-old Chinese teacher at a senior middle school in Italy, who has attended large-scale Falun Gong activities in New York since the early 2000s, recalls that New Yorkers then wouldn’t accept material from practitioners or even hear them out. At an event outside City Hall on Tuesday, however, “casual strangers in the streets asking for directions accepted our pamphlets, were curious to hear about the persecution, and even expressed interest in learning the practice,” said Qiu, who is an Italian citizen. An hour and a half after the march began, the last Falun Gong practitioners—a mother with a little girl in tow—stepped into Foley Square, the end point of the march. Banners were folded and stored away, and most of the marchers headed off in different directions. “They’re going to Bowling Green Park, Central Park, and Times Square,” said David Tompkins, one of the organizers of World Falun Dafa Day. Tompkins and co-coordinator Yi Rong have plenty planned for the week—Falun Gong exercise demonstrations in Central Park, candlelight vigils outside the Chinese Consulate, and a parade on Friday. Some of the Brooklyn Bridge marchers stayed behind at Foley Square where festivities were already under way: performances of classical Chinese dance, traditional instruments, and a helping of Western music. Hundreds of tourists and residents in Jerusalem learned about the ancient Chinese practice of Falun Dafa and how it is severely persecuted in China. On May 10, Falun Dafa practitioners from Spain and Portugal gathered in the capital of Spain to celebrate World Falun Dafa Day. On May 13, thousands of Falun Gong practitioners gathered at Chiang Kai-Shek Memorial Hall in Taiwan to commemorate World Falun Dafa Day.